Interior design trends of 2019 are all about functional fittings. In the home, this translates to tidy rooms with pull-out furniture like sofa-beds, futons and extending tables. In the office, this translates to adjustable desks, so you can work sitting or standing, laptops for work away from headquarters and partitions for privacy between teams. When brainstorming ideas for your office make-over, a good place to start is by improving what you already have. For example, if you make use of basic office partitions between desks, why not use desk plants instead? Office plants have been proven to boost productivity and creativity, so doing something as simple as swapping out your partitions for greenery could see an increase in your returns down the line. Adding office plants to your workspace is a magnificent way to transform it into a desirable place to work. Eco-themes are the future; they are an easy and affordable way to instantly upgrade an area and with a huge variety of plants to choose from they will have a unique feel. 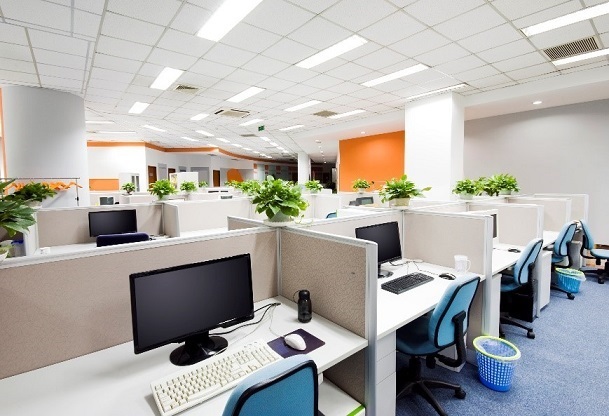 It might seem obvious to some, but making sure that office supplies and useful items are in a designated and central location can save employees a lot of time, especially when inducting new employees, to whom the office is a strange new place. When rearranging your office, it’s a good idea to try to avoid moving these key supplies so that your workers can stay orientated. Think about why you are engaging in an office make-over; if you are doing it to impress clients, then you want something stunning, but if you are hoping to increase work quality and output amongst your staff, then you might be more interested in adding some facilities that they will surely appreciate. Perhaps you can improve on the simple staff kettle that most (if not all) businesses have somewhere on their premises. The point of tea breaks – from an employer’s perspective – is to encourage organic team building opportunities. You can further improve the relationships between your staff by providing them with access to gym facilities or making use of outdoor spaces to create a roof terrace, or courtyard with cafe style seating. We all recognise the benefits of encouraging a cohesive team that supports itself. If you already provide these facilities to your staff, it’s always good to rethink how your staff are using the facilities. An influx of new employees might mean that the facilities you provide aren’t as relevant as they were before. Is your office exciting enough? Take an objective look about. Is it a generic space with white walls and a grey carpet? Being bold and adding some striking colour to a few feature walls, or areas of the office space will give your office a fresh new feel. You could strengthen your brand identity by using a palette in your brand colours. Accent colours used in planters, soft furnishings and artwork will give the new scheme a pulled-together cohesive look. Colour is a visual experience and actually has a subconscious effect on the brain. 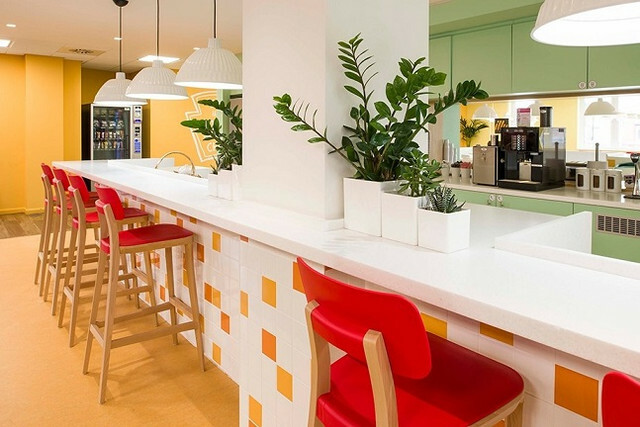 Colour in the workplace has an effect on productivity, mood and emotion. Warm colours like reds and oranges are known to raise energy levels and improve dynamism. Cool colours like blues and greens are shown to create a calming effect and improve critical thinking. 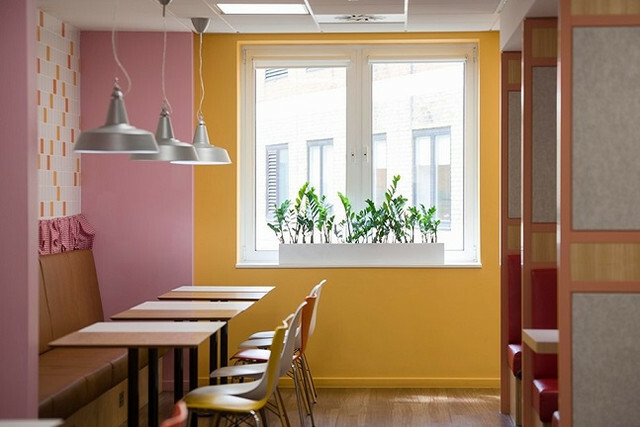 Repainting your office and changing up the colours from time to time will ensure the office always looks fresh and clean and your colleagues will appreciate the effort that you put into providing them with a beautiful place to work in. Above all else, if you are going to be making improvements to your office, you should always consider the effects of your lighting. 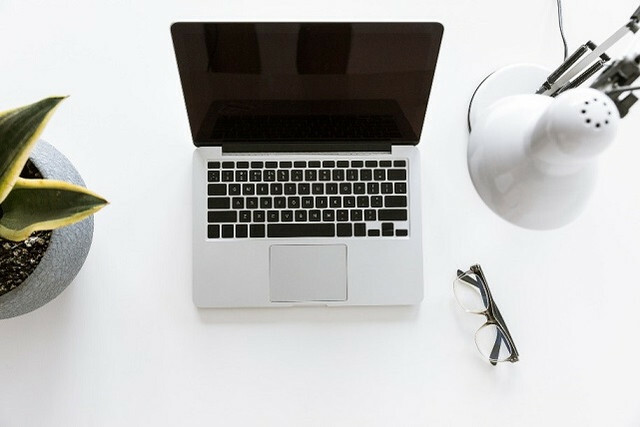 We doubt that you’re submitting your staff to dodgy fluorescent lights that blinks on and off, but any inadequate lighting is unhelpful and could be costing your employees in new glasses prescriptions. We recommend offices with lots of natural light, but if you can’t remedy being in a dim office with very few windows, you can always supplement the existing natural light by adding mirrors to carry the light further by reflecting it. As well as prioritising sources of natural light, you should use lamps and high-quality light bulbs to make sure that your office shines. The perfect office is possible; all you need are plants, perks, a touch of colour and some great lighting. We are more than happy to provide you with the plants, planters in every hue, and take care of them for you too. To give your office a boost that outstrips your competitors, get in touch.